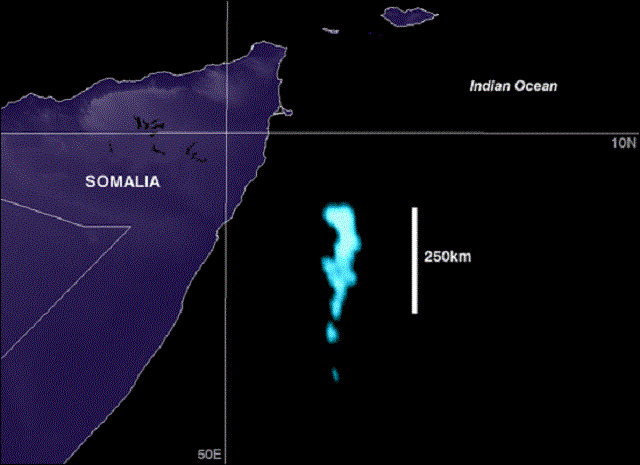 Defense Meteorological Satellite Program image of the "Milky Seas Effect" off of the Somali coast on 25 January 1995. Milky seas are unusual phenomena where large areas of sea water, often from horizon to horizon, glows intensely at night, and can last from several hours to several days. Sometimes it is brilliantly enough at night to be seen by satellites orbiting Earth. Since the 17th century, "milky seas" have been a subject of folklore within the sailing world. Fictionally, such a "milky sea" is described by French science-fiction writer Jules Verne in his classic novel "Twenty Thousand Leagues Under the Sea" published in 1870. According to Bioluminescence Database established by British Meteorological Office, there have been 235 documented sightings of milky seas since 1915 - mostly concentrated in the north-western Indian Ocean and near Indonesia. Although the origins of this light are not well investigated, the most plausible explanation is that it is caused by blooms of bioluminescent bacteria. In 1985 a research vessel in the Arabian Sea took water samples during milky seas. These samples indicated the presence of a type of bioluminescent bacteria in the water, known as Vibrio harveyi. However, the scientific community largely ignored them, as it was thought that the concentration of bacteria necessary to create such a massive glowing area was impossible. In 2005, a group of scientists led by Dr. Steven Miller of the Naval Research Laboratory in Monterey, California, US., decided to take a closer look at this milky sea effect. Dr. Miller and the research team searched ship reports of milky sea sightings since 1992 and compared these with archived OLS satellite data acquired from the U.S. Defense Meteorological Satellite Program. Miller came across the logs of British merchant vessel, the S.S. Lima, which recorded crossing the milky seas in northwestern Indian Ocean on the night of January 25, 1995. Enhancement of OLS imagery collected roughly 30 minutes after the ship's report of initial sighting revealed a massive region of low-level light emission. The glowing waters spanned an area roughly the size of Connecticut (over 15,400 sq km) and lasted at least three nights. The event took place in the northwest Indian Ocean, approximately 280 km off the Somali coast. The boundaries of the feature matched closely with a surface ship's reported entry and exit of the brightly glowing waters.